Floral decorations are an incredible way to finish off a simple cake, and whilst the results look so amazing you might think you couldn’t possibly achieve them yourself, if you’re armed with the right kit it’s surprisingly simple to get that professional-looking finish. The secret to flawless floral cakes? Just a few inexpensive icing tools and a little imagination – they’re all you need to craft beautiful bouquets to sit atop showstopping bakes. Two different types of flower adorn our floral bakes: the roses, carnations and peonies made by cutting out and rolling up sugarpaste or fondant icing, and the meringue buttercream daisies, tulips and foliage that were piped on using Russian icing nozzles. All these beautiful finished versions were made using variations on the same piece of kit – easy flower cutters. A classic bloom beloved by all, this fairy tale favourite is easily recreated using our Easy Rose Cutter, and the pack of two Small Easy Rose Cutters to make the blossoms. We also used an Icing Rolling Pin to roll out the icing and a Water Brush to help stick and hold the petals together. To get the rich, ruby red colour we used Renshaw Ready-to-Roll Red Icing. Dust your work surface with cornflour and roll out your icing to 1-2mm thick. Press down your easy rose cutter to cut out the shape, then ‘thin’ the edges with the end of your rolling pin. Just above the centre line, brush a line of edible glue or water along the full length. Fold in half and press firmly along the fold. Brush another line of edible glue or water along the bottom edge. Start rolling tightly from one end to create the rose, shaping the petals as you go. Delicate of petal and crimped of edge, carnations add a little extra ‘frill’ to your bakes. You’ll need the Easy Carnation Cutter to get that perfect crimped edge – once that’s done, simply fold and roll as above. We made both peach and pale pink blooms, using Renshaw Ready-to-Roll White Icing, coloured with the Wilton® Colour Right System: 1 drop each from the pink and brown colours for the pink, and one drop each of yellow and brown for the peach. Roll and cut out the icing as for the roses above. Little plastic ‘teeth’ round the outside of the cutter will leave the ‘petals’ with divided edges. Using a frilling tool, work along the curved edges, rolling back and forth to create a frilly effect. Plump-headed peonies make a fantastic floral focus on any bouquet-topped bake, and our 3-piece Easy Peony Petal and Leaf Cutter Set lets you finish them with foliage too. You’ll need two different shades of sugarpaste for this one – darker for the inner petals, lighter for the outer petals – we mixed Renshaw Ready-to-Roll Red Icing with Renshaw White Modelling Icing to create the desired two-tone tints. Roll the darker paste into a ball that’s narrower at the bottom, rounded at the top and sits in one of the ‘petals’ of the smaller cutter. Mark the top of the ball three times with the cutter to form a criss-cross effect, then roll out and cut two strips using the smaller cutter. Thin the edges as before then press the end of the pin into the centre of each petal to create a shallow cup shape. Add edible glue or water to the centre of each petal on the top row, fold in half, then add more ‘glue’ to the petal centres. Roll the first strip tightly into a bud then wrap the second strip around this. Using the larger cutter this time, repeat steps 1-4 with two strips in the paler shade. Wrap both strips of the paler petals around the darker ones to create a full bloom, then leave to dry in a cupcake case. Press a small brush between the petals to separate and shape them into the perfect peony. If desired, cut out leaves, add veins, allow to dry then attach to the back of your blooms with royal icing. Our top tips: To make larger blowsy blooms, add another strip of petals; for buds and smaller blooms, cut the paste into two smaller shapes before rolling. Cut off the bottom of each flower to make a flat surface for easier positioning on top of your cake. Once your fondant fancies have been created, it’s time to move on to all the little piped plant life that will take the top of your cake from blank canvas to flower bed. Tulips, rosebuds, daisies and grass – you can make them all with our clever Russian Nozzle Icing Set. These flat-topped, multi-perforated icing nozzles let you create all kinds of fancy floral effects – we had loads of fun experimenting! Just choose whichever flowers or foliage you’d like to add, fill a piping bag with stiff buttercream and you’re ready to go… a few minutes of practice on a piece of parchment – or a biscuit, if you’d like to eat the results – will have you turning out neat little flowers by the dozen. Mix up the buttercream and add colour. We used Wilton’s Colour Right System to create the shades we wanted: two shades of pink for the tulips, green for the leaves. Attach the three-part coupler set nozzles to piping bags, then fill two piping bags with the lighter pink and one with the darker pink buttercream. Gather the three bags together so you can slide the Russian nozzle and coupler ring over them. Add the closed tulip petal nozzle, slide on the coupler ring and screw firmly into place. Holding the piping bags upright, gently squeeze and pipe your blooms into place. Finish off with foliage – we used a leaf decorating nozzle (no. 352) to complete the look. The stiffer your buttercream mix, the more impressive the end results – we used an Italian meringue buttercream as it holds its shape better than softer ‘normal’ buttercream. For best results, keep the piping bag as upright as possible, get the tip really close to your cake and squeeze… then lift it away when your flower is the height you want. 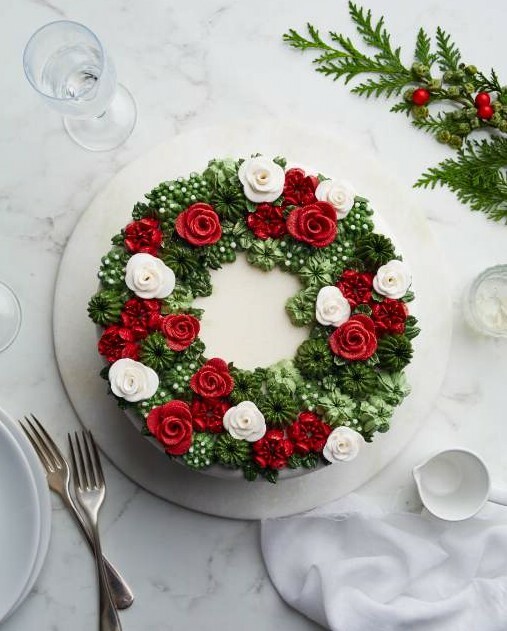 If you’re decorating a larger cake, you might find it easier to pipe your flowers onto baking parchment, freeze them, then add them once they’re frozen. They’ll be lovely and firm when you come to attach them to the top, and you’ll be able to position and reposition them until you’re completely happy. We hope you have as much fun creating your own beautiful, blossom-topped bakes as we did!